Along with completing all the lessons up to 6 as well as the box and cylinder challenges, before starting this lesson you will be required to complete the 25 wheel challenge as well. Up until lesson 5, I've been very adamant drawing everything freehand, with felt tip pens, and so on. And this has been for a good reason - it's important to maintain a certain degree of the right kinds of challenges to ensure that you guys gain as much as you can from each lesson. Whenever drawing freehand, I still want you to apply the methodology I've outlined in the past - the ghosting method, drawing through ellipses, and so on. That said, in this case it is inevitable that with all of the necessary construction lines, and the significance placed on precision, it's important for you to be able to use tools that will allow you to focus more on the meat of the lesson, which is really about the manipulation and construction of complex compound forms. As before, do not use pencil or digital media. 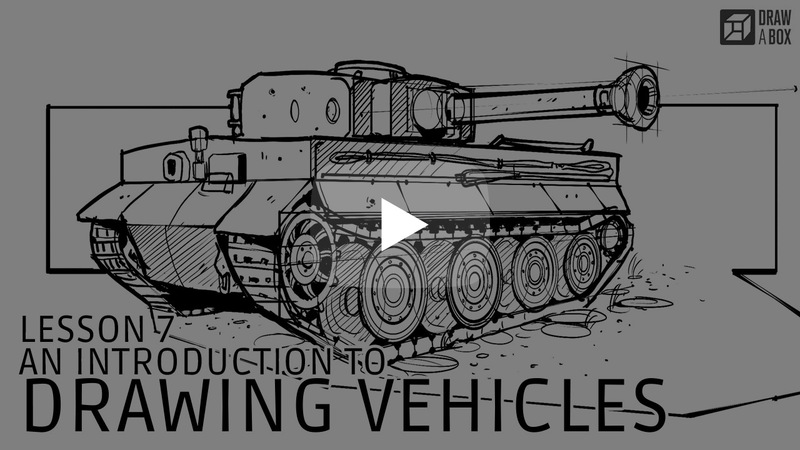 Now we're moving onto vehicles - the last of the dynamic sketching lessons, as far as I've planned. This lesson is very similar to the last one, the only difference being scale. It's definitely an interesting experience, drawing these subjects from life - especially the first two: trains and tanks. Wrapping your head around an object so much larger than you can be tricky at times, and it makes for great practice. In the previous lesson, we talked about how we can find the center of a plane in perspective, and use that to subdivide it in a number of ways. You can also use the reverse of this concept to take a measurement you already have and repeat it back or forwards in perspective (very handy for placing wheels). Since we know that the diagonals of a plane will intersect at its center, you can treat two planes that are side-by-side and equal in length as being two halves of the same plane (I'll refer to it as the compound plane). Knowing this, if you have a center-line running through them in one dimension, the center of this 'compound plane' lies at the point of intersection of that center line with the line that separates the two individual planes. To copy the measurement over, just draw a diagonal from the corner of your plane through that red point, as shown here. 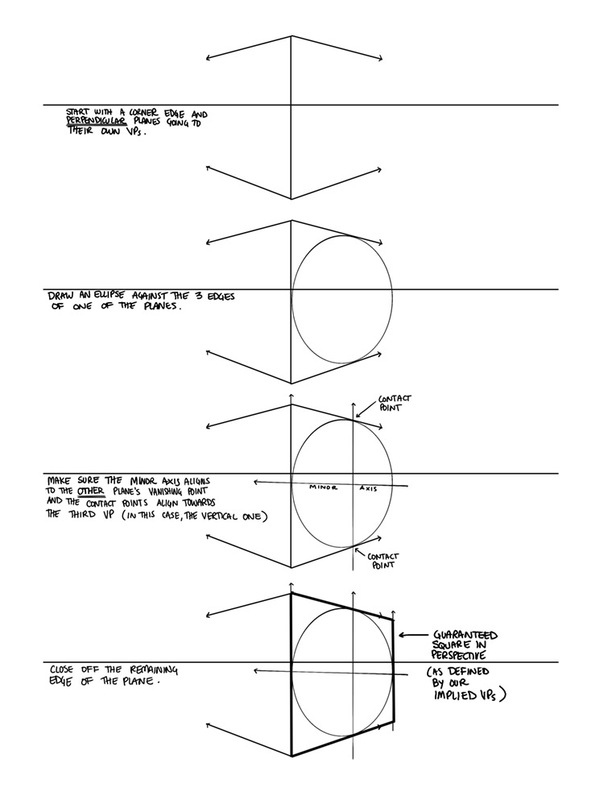 People ask about this every now and then, and it isn't until this point that I'd actually feel it appropriate to teach this technique (although it is referenced in the cylinder challenge as well). 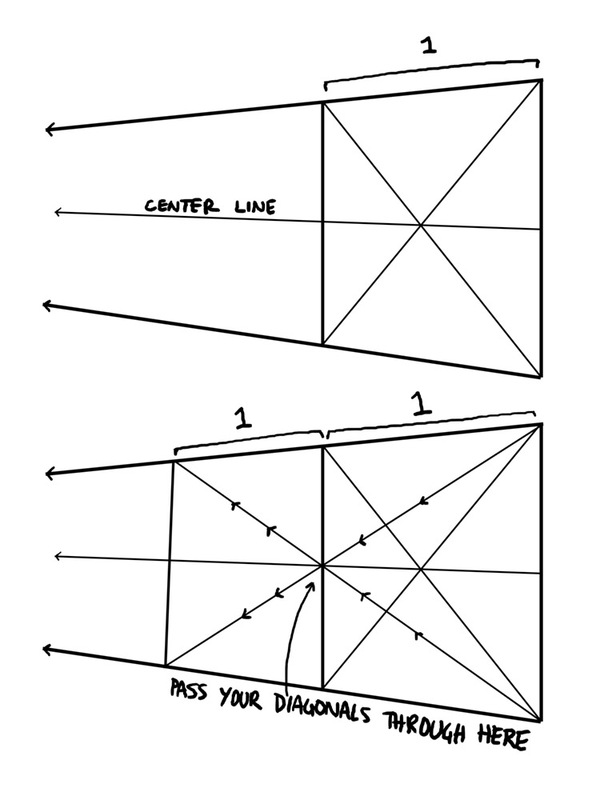 Basically, you can construct a proportional square in 3D space relative to two perpendicular vanishing points (that is, vanishing points whose sets of lines are perpendicular to one another) - it's just a downright pain, especially if you don't have an ellipse guide. Start out with two perpendicular planes set edge to edge, forming a corner. Leave the far ends of these planes open, as we haven't yet determined their lengths. Pick one of these planes to turn into a square - you can do the other one afterwards by applying the same steps. In this chosen plane, draw an ellipse. This ellipse must meet two criteria - first, its minor axis (the line that cuts it into two equal, symmetrical halves down its narrower span) must align to the same vanishing point as the other plane. Not the plane it's on, that's a common mistake. Secondly, the points at which the ellipse contacts the two parallel lines of its enclosing plane must align towards the third vanishing point (which in this case is the vertical one). Assuming that these criteria have been met, then this ellipse represents a proper circle in 3D space, and therefore any plane enclosing it will represent a square. You can go ahead and close off your plane so the final edge just touches the exposed side of the ellipse - you may need to extend the other edges, as I've done here. Now there's nothing stopping you from applying these steps to the other plane once you've handled the first. With those two planes properly set up as squares, you've essentially got everything you need to create a cube, and from there you can apply the repeating measurements technique above to extend that cube to whatever set proportions you like. Before starting the homework, be sure to go through all of the demonstrations included in this lesson. I strongly recommend drawing along with them as well and following them closely when doing so. Also, remember that this homework must be drawn from reference. When looking for reference, I recommend that you specifically look for those of a higher resolution. Google's image search tools allows you to limit your search to large images, and I recommend you take advantage of this. It also wouldn't hurt to do a few studies from life (at least when tackling cars). You may even want to see if you've got any kind of museums near by that feature relevant objects. 1 page of form intersections from lesson 2. 1 page of cylinders in boxes, along with the error-checking method. You may do these with an ellipse guide. 4 pages of form-intersection vehicles. These are purely constructional, approach them as you might the form intersections from lesson 2. Focus on drawing through your major geometric forms. you can break them down as far as you like, but remember that we're not interested in the smaller details. 8 pages of vehicles. Mix it up - you don't just have to do things with wheels. Boats, planes, wagons, space ships, etc. are more than welcome. As long as it is used as transport and is large enough to hold a human being within it, it's fair game. You are welcome to use an ellipse guide, a ruler, and a ballpoint pen if you wish. No pencil or digital media, and stick to one kind of pen for your linework (though a brush pen can be used to fill in large dark areas if appropriate). These are my favourite sketchbooks, hands down. Move aside Moleskine, you overpriced gimmick. These sketchbooks are made by entertainment industry professionals down in Los Angeles, with concept artists in mind. They have a wide variety of sketchbooks, such as toned sketchbooks that let you work both towards light and towards dark values, as well as books where every second sheet is a semitransparent vellum. Having your work reviewed by others is critical, as those who are just starting out aren't in a position to properly judge their own work, and won't be for quite some time. Don't be afraid to show your struggles - it's by analyzing your mistakes that we can help you grow. Perfect homework is not what we're looking for; we just need it to be complete. There are currently two places you can get your work critiqued by the community - Reddit and our Discord Chat Server. 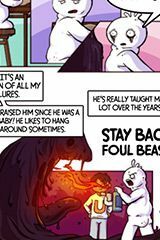 If you are interested in receiving extra help, I critique the work of those who support Drawabox on Patreon. All of these private critiques are done through reddit, in specific threads where students post their work as a comment, including a link to their work (often hosted on Imgur, though most image hosts are okay). The minimum pledge for this lesson is $10.00/month. 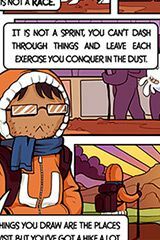 The orange button above will take you to the reddit thread for this lesson, you can post a link to your work there and I'll be notified. Once I catch the submission, I'll add it to this backlog spreadsheet. Pledges are collected at the beginning of the following month, but you may start submitting your work immediately. If you're a new patron, I'll be reaching out to your shortly to collect your reddit username.